We woke to a beautiful, sunny morning. Dunedin had looked impressive last night. It has a reputation for being the Edinburgh of the southern hemisphere, so we thought we would spend a day absorbing the cultural delights of the city. Driving in and finding somewhere to park was easy, largely due to Angela’s excellent navigational skills. Our first port of call was the First Church of Dunedin, a spired church overlooking the old harbour from on high. The sign on the door as we entered welcomed passengers from the cruise ship Princess ??? When we ventured into the Heritage Centre at the back of the church we were asked if we were from the cruise ship Princess ??? As soon as we said ‘no’ they seemed to lose interest in us. Back in the Octagon, the centre of Dunedin, we were asked if we were from the cruise ship Princess ??? ‘No’, I said, ‘but what would have happened if I had said yes?’ Apparently, I would have been asked questions. Glad I wasn’t on the cruise ship, Princess whatever its name is. The Octagon has a number of bars and restaurants, the art gallery, a cinema, St Paul’s Cathedral and the house of justice around the edges. The restaurants all looked a little tired. In the middle was a market that was very disappointing for the city. I have seen better in much smaller towns. We ventured into the art gallery, an impressive building. On the whole the art within was fairly unimpressive. We struggled to find the heart of the city. Princes Street, which I assume had at one time been the heart now looked a little run down and disappointing. Princes Street runs into George Street and that is where we found the heart. George Street is where the shops are and the shoppers. 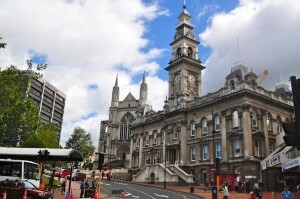 The place was alive with lots of young people – Dunedin is the premier university town in New Zealand and the population increases by 25,000 during term time. Struggling to fill the day with cultural activity, we visited St Paul’s Cathedral after lunch. It has the outward appearance of being a traditional church built on standard lines. What a surprise as you enter and find a traditional nave but a concrete, modern altar end. Apparently, when they originally built the cathedral in the early 20th Century they ran out of money by the time they got to that end of the church. In the 70s they found the money to do the job properly but building traditions had moved on. It works quite well but it has certainly raised some local eyebrows and is a cause for some discussion. By now we had both had enough of culture and the city, so took ourselves off to explore the stunning Otago Peninsular, created out of an ancient volcano. The sunshine of the morning had given way to cloud, which occasionally produced sharp showers on a strong breeze. 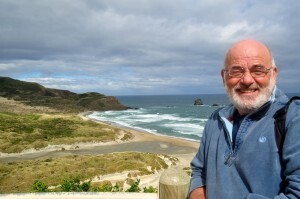 We found some really stunning locations – Sandfly Bay, Hoopers Inlet and Taiaroa Head. 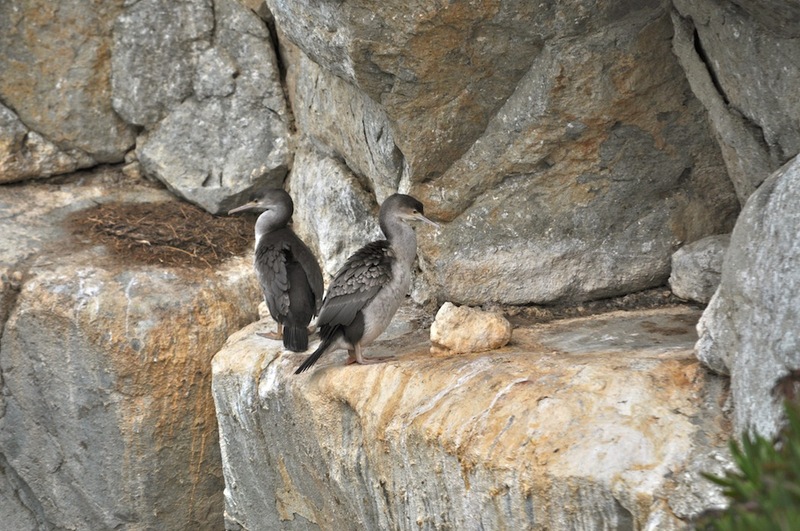 Penguins live at Sandfly Bay but as we are having a penguin day tomorrow we left them in peace. 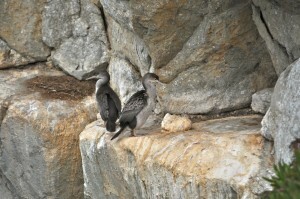 The highlight of Hoopers Inlet was wading birds searching for food and Taiaroa Head, as well as being home to the Royal Albatros Centre (also on the menu for tomorrow) is also home to a great many nesting sea birds on the cliffs. We are looking forward to an exciting time. We had a DIY breakfast in our large ‘suite’,which came with double & single bed, fully equipped kitchen and bathroom, TV & free Wi Fi. Coffee (Flat White & Americano with warm milk on the side) was taken overlooking the ocean on the newly renovated Esplanade. Lunch in a café in the city and a dinner back at the morning’s haunt on the Esplanade…….the restaurant was called Swell……and it was, so were we and so was the sea! !